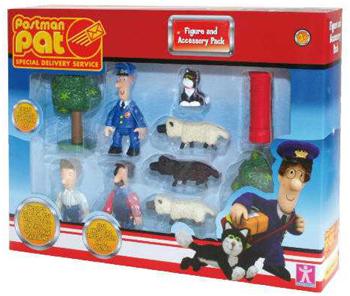 2010 saw the release of the first SDS Postman Pat Figure and Accessory Packs from Character Options. These are the ideal compliment to any playset or Postman Pat vehicle. Initially released as a retailer exclusive, Tesco in this case, the Postman Pat Special Delivery Service Figure and Accessory Pack includes figures of Pat, Jess, Ben and Ted. Also included are three sheep (two black, one white), one tree and a red postbox.